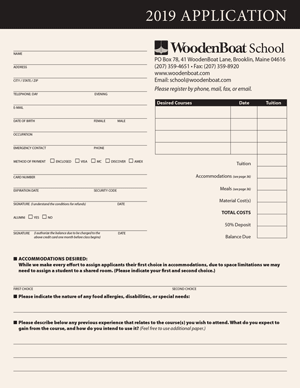 WoodenBoat School is approximately 250 miles from Boston by car, and 150 miles down east by boat. Airline service is available to Bangor, and WoodenBoat can provide transportation from there for an additional fee. Please notify us two weeks in advance if you need to be picked up at the airport. Details of this will be sent to you with your course confirmation. Your course begins with dinner at 6:00 p.m. on Sunday, followed by a general meeting and an introductory session with your instructor. The Sunday dinner is for all students, whether or not they are taking board with the School. You may arrive at the School anytime you wish after noon on Sunday. You will find room assignments and other information posted in the entryway of the Student House. The School Director will be at the Student House at 5:00 p.m. to meet you. Most classes end on Friday afternoon. Students are asked to depart on Saturday morning. If your course ends on Saturday, you have your room/campsite for Saturday night.